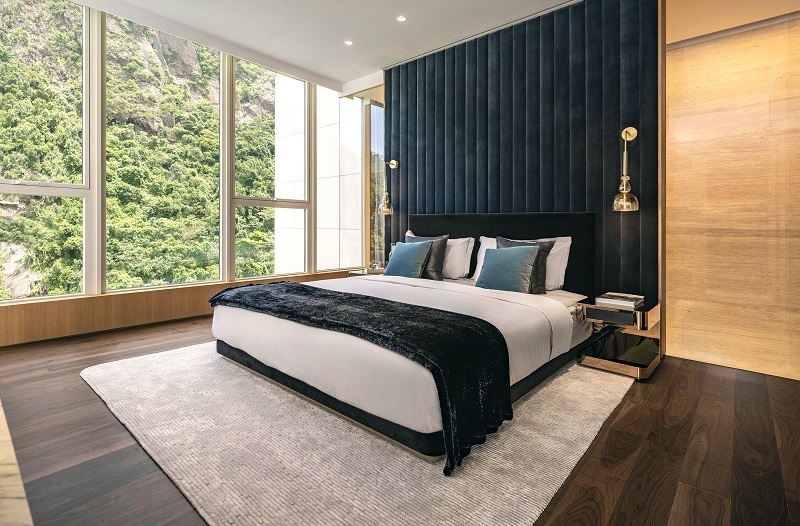 (26 July 2018, Hong Kong) Phoenix Property Investors (“Phoenix”), developer of THE MORGAN, the award-winning luxury residence at 31 Conduit Road in Upper Mid-levels, has unveiled the design of its exclusive two-storey residence, The Morgan Sky Duplex. 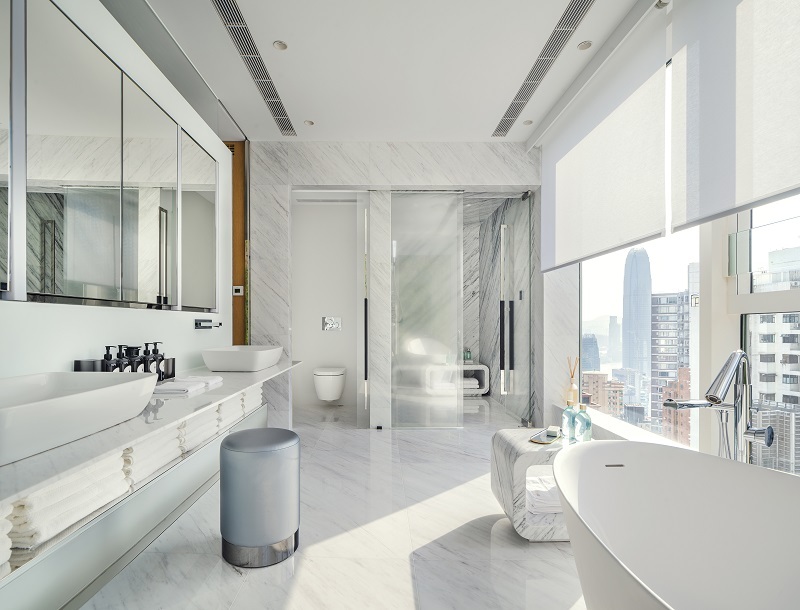 The Morgan, designed by globally-acclaimed Robert A.M. Stern Architects, one of Architectural Digest’s Top 100 design practices in the world, is the award-winning residence whose distinctive architectural aesthetic serves as the design guide for a collection of masterful special units. Richardson Sadeki (“RS”) have complemented the buildings iconic architecture with their lavish interiors for The Morgan Sky Duplex and reflected precisely Phoenix’s commitment to delivering superior design and impeccable craftsmanship. “Places and spaces have their own life, their own aura. The aura of a place is the raw material of my work,” says Heidar Sadeki, Co-Founder and Creative Director of Richardson Sadeki. “In designing The Morgan Sky Duplex, I was inspired by the lush green expanse of Victoria Peak on one side and the Hong Kong skyline on the other side, so I created a dialogue between the serenity of the natural environment and the complexity of the city’s urban fabric. The interior design takes on a cinematic narrative where spaces imitate and examine this duality, evoking different emotions and creating contrasts and harmonies as one moves through the residence. Thanks to a successful collaboration with Phoenix, I was able to compose one of the most romantic spaces I have designed to date,” Sadeki continues. Richardson Sadeki is an award-winning design studio known for designing cinematic spatial experiences for luxury residences and high-end hospitality projects. A New York-based global architecture and interior design firm with satellite offices in Hong Kong, Los Angeles and Miami, RS has completed noteworthy projects all around the world. The firm has received numerous industry accolades, including the Gold Key Awards 2009 for Lapis Spa in the spa category, and the International Design Awards (IDA) 2013. A cross disciplinary studio, RS is well recognised for their excellence in architecture, interior design, bespoke furniture design, graphic and packaging design. The Sky Duplex, located on the 28th and 29th floors of The Morgan, offers spacious interiors with a saleable floor area of 2,343 sq ft and ceilings up to 3.5m* high. A private staircase connects the two storeys allowing access to respective elevator lobbies on the two floors. The main entrance, situated on the 28th floor, leads to a 800 sq ft foyer, the living areas and a 460 sq ft^ terrace; each saturated with natural night. Heidar, placing an emphasis on creating a sense of balance and harmony in the space, creates symmetry in the choice and layout of furniture on the private terrace and in the living room; resulting in a special double living area. The upper floor of the duplex comprises three bedrooms and a bar; luxuriously styled with custom furnishings and fabrics. By establishing a particular relationship with the stunning landscape, the duplex takes full advantage of available natural light. 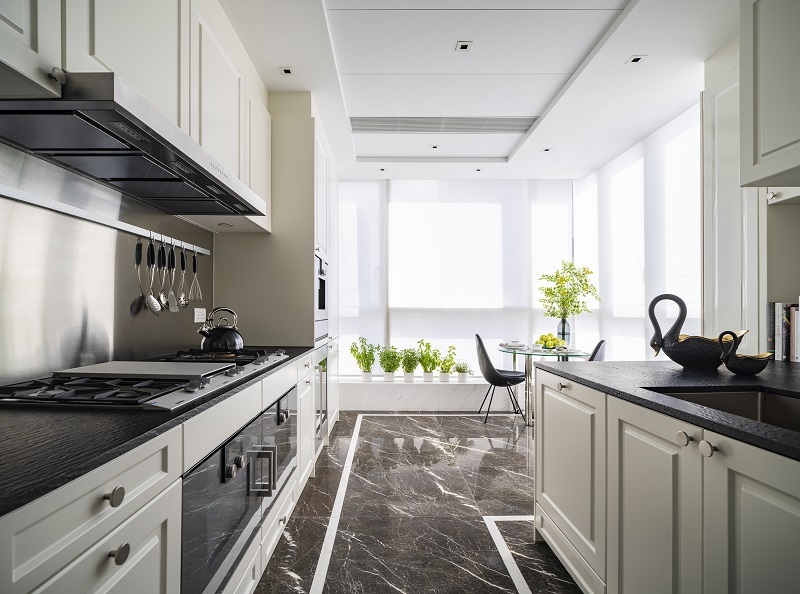 The overall design takes advantage of an array of natural timber and stones, such as Italian Bianco Zebrino marble, Greek Ariston White marble, Spanish Nero Marquina marble and Turkey Ivory Travertine marble. The residence is also equipped with state-of-the-art technology throughout. The home automation system allows residents to control the lights, drapery and other home appliances with ease and convenience. The living area, comprising the lounge and family room, is situated to the right of the foyer. A 2.4m long light gray sofa enjoys a commanding position in the Lounge; while a 6m x 6m Turkish Ivory Travertine marble stone wall has been installed along the double-height void to establish grandeur unique to a luxury residence, and to echo the exterior of THE MORGAN’s architectural style. The family room, which features a stone wall with a built-in TV cabinet, is also an extension of the open-planned living area and seamlessly connected to an outdoor terrace equipped with an automated sunshade. The light-filled space evokes a leisurely ambience; perfect for quiet contemplation or lively gatherings. The private terrace embraces furniture in hues of dark grey, accompanied by an elaborate landscape design that features a series of seasonal flowers, herbs and plants; blending the space harmoniously with nature. Residents will enjoy the sweeping views of Victoria Peak while lounging or dining on the terrace, with a barbeque grill to enjoy outdoor cooking in private luxury. The living and dining areas are separated by a sculptural hallway that doubles as a gallery space for artwork. Featuring walls crafted from dark timber and lavish suede drapery, the dining area creates a visual contrast to the subtle aesthetic of the living room. The custom brass geometric folding screens add detail and a dimension to the space. 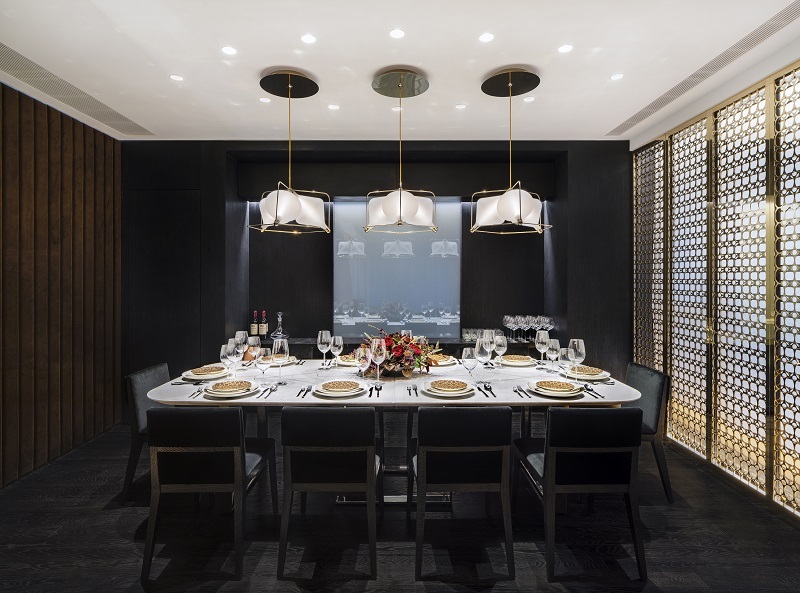 The 500 sq ft dining area and kitchen space is highlighted by a Champagne gold mirror and metal-finished, hand-blown, Lasvit’s Pendant Clover lights, as well as a 10-seater marble dining table custom-designed by RS – everything fitted to curate a unique culinary experience. An atomizing glass wall separates the dining room and kitchen to let natural light into the space while retaining privacy. The Kitchen, fully equipped with a range of Gaggenau cooktops and ovens for all cuisine applications, also serves as a breakfast area. A wine cellar, a dishwasher and a Sub-Zero fridge, matched with Poggenpohl white cabinets, will fulfil all entertainment needs. Residents can access the upper floor by the private staircase. At the upper foyer is a sleek, modern bar equipped with a mini refrigerator and a cocktail trolley for residents to serve evening tipples in style. Access to the 29th floor lift lobby is cleverly concealed with floor-to-ceiling panels to ensure a high level of privacy and convenience. The 500 sq ft master bedroom, a lavish suite comprising the sleeping area, spa and walk-in closet, is a continuation of the interior design theme of balance and harmony. The sleeping area is composed of timber of varying shades; the navy blue suede headboard, sculptural bedside lamps and metallic mirrored surfaces place emphasis on the high ceiling and add a sharp edge to the space; together creating a relaxing, warm ambience. Heidar’s design divides the sleeping area and spa room with a white marble multi-functional cabinet and glass doors. Beyond the partitions is a splendid Turkish spa and bathroom equipped with a freestanding bathtub by Gessi, and a spacious steam room and showers. This relaxing haven can accommodate several family members simultaneously. Here the walls and platform are covered in Greek Ariston white marble with floor heating. The clean, light shade matches exquisitely with the views of Victoria Peak, offering an elevated wellness experience. The walk-in closet is especially well-appointed with a ladies’ dressing area, closet, shoe and handbag cabinets, as well as a man’s suit racks, and belt and shoe cabinets – the perfect space to dress for any occasion. The other bedrooms display the same elegant, contemporary style. The layout of the second bedroom, known as the Traveller’s Room, is inspired by themes of exploration and discovery; the soft and simple design is accentuated by dark timber furnishings and modern table lamps, all paired with unique design details to create a personal, relaxing ambience. The third bedroom takes on the theme of a Connoisseur’s Room, appointed with leather panels and timber furnishings of darker hues. Both bedrooms offer open city views, and are all equipped with extensive storage and closet spaces. Heider Sadeki, reflecting his penchant for bespoke detail of the highest quality, has designed a unique collection of furniture for The Morgan Sky Duplex. This includes a plush sofa, lounge chairs, coffee table and a sculptural white marble chair especially created for the spa. All have been crafted exclusively for this residence. Richardson Sadeki has also sourced an inspirational range of accessories and artworks from various locations to decorate the home – a showcase to treasure. Complementing the luxurious interiors of the residence is a unique collection of artworks. These include the SimCity painting by the Hong Kong artist Sim Chan in the living room, and art pieces by New York artist Alex Amini in the living room, bedrooms and powder room. Photographs by Heidar Sadeki, highlighting the work of famed sculptor Richard Serra, grace the timber-framed, gallery-inspired hallway on the second floor and dramatically connecting the bar area to the bedrooms.